I know you’re a fan of the Mac mini media center and I’ve tried to follow your example. The problem is, the computer I use to rip DVDs is in my basement office and my media center Mac is upstairs. I know I can copy files from one to the other via file sharing but I’d love a way for movies I rip to be automatically added to the mini’s iTunes library. Any suggestions? Do as I do and follow along. On the Mac mini media server, launch System Preferences, select Sharing, and enable both Screen Sharing and File Sharing. Now move to the Mac where you rip your DVDs. On that Mac, screen share to the Mac mini. (You might find my tip for creating a screen sharing shortcut helpful.) Launch iTunes on the mini. Now, navigate to the folder where you store iTunes’ media files—movies and music, for example. By default its in youruserfolder/Music/iTunes/iTunes Media. Within that folder you’ll spy the Automatically Add to iTunes folder. This folder causes items placed in it to be added to iTunes. Hold down the Command and Option keys and drag this folder to the mini’s desktop to create an alias of it. Now drag that alias out of the screen sharing window so that a copy of it is on your DVD-ripping Mac’s desktop. Leave it there. When you next wish to rip a DVD, launch HandBrake, insert the DVD, choose the title you want to rip, and click the Browse button that appears next to the Destination field. In the resulting sheet navigate to the copy of the Automatically Add to iTunes alias that’s on your desktop and click Save. The path to the saved file should point to this folder. 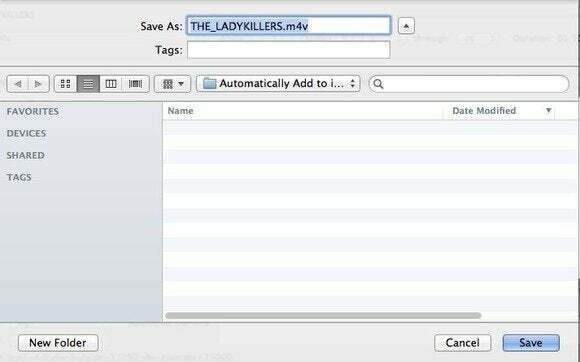 Within HandBrake choose the Automatically Add to iTunes alias copy as the destination for your ripped movies. Now rip the DVD. When the job is finished the resulting movie will be moved to the Mac mini media server and placed in your iTunes library, ready to play. Have a question of your own? Send it to mac911@macworld.com.